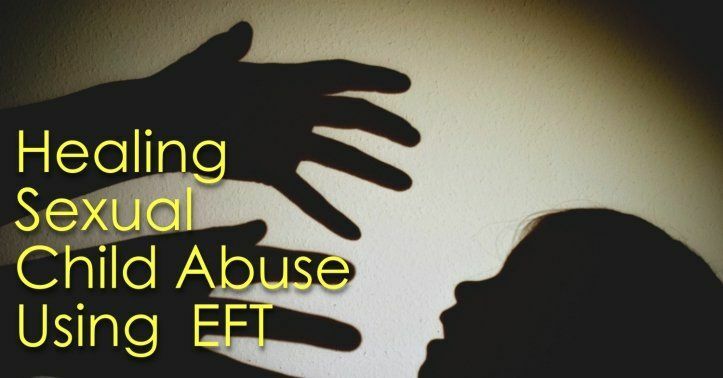 EFT for child sexual abuse | Mahalakshmi explains how it works. Child Sexual Abuse! A serious concern in our society today. Yet, many get swept under the carpet, overlooked, underestimated and what not. Many a client who walks into my office may report varied symptoms – poor interpersonal relationship, phobias, insomnias, skin problems, or sudden bursts of anger. At times, it may be all of the above symptoms, while many a time only a few of them may prevail. Irrespective of that fact, a common feature is that the individuals reach a non-functional or near non-functional state due to these symptoms. The clients may be from different age groups, varied backgrounds, but the case history taking session, usually points out to one cause in almost all the cases – Child Sexual Abuse! Child sexual abuse is a huge malaise, eating up our society’s functionality. The interventions are delayed mostly because of a lack of awareness of the intensity of its impact. As a therapist, I focus on the symptoms and not on the incident. In such a perspective, the different symptoms to be addressed may be crying spells, aggression, self-isolation, poor focus, insomnia etc. The emotions that may need to be dealt with may be guilt, anger, hurt, emotional pain, and fear. Feelings of poor self-worth are very common. Self-criticism is again a major common symptom. The list may seem long. But quick, easy steps may help in bringing the situation under control. Emotion Freedom Technique, ( EFT) founded by Gary Craig is a very effective therapeutic technique to handle trauma following sexual abuse. EFT is very commonly known as the “ tapping technique”. EFT for child sexual abuse is one of the most sorted and efficient technique to cope with the trauma. It is a technique of tapping specific meridian points along with specifically related affirmations, otherwise known as “ set up statements”. The concept behind this intervention is that the meridians in the energy field are blocked due to various emotional distress. The EFT tapping therapy with appropriate statements/ affirmations helps in clearing the blocks and thus restoring harmony in the energy field and thus related wellness state in the person. Many of my clients have often provided a feedback of how watching the videos on EFT online, is “ not very effective”. The purpose of the online videos is to create awareness about this beautiful intervention which is indeed Godsent. Heartfelt Gratitude to Gary Craig for this. It is extremely effective when used by a trained therapist. Following the case history session, I go through the same to identify the difficult emotions and experiences faced by the clients. I enquire with the client which area of distress is his/ her concern. Based on the reply, I prioritize. With the client’s acceptance, I form the setup statement and lead the client through the session, assisting him/her to release the blocked emotions. We tap together, altering the setup statements as the client moves ahead in the session. The client may report some physical symptoms during the session and they need to be given importance to. Even though I may have identified that the root cause of the present distress is the trauma of child sexual abuse, I may not directly approach it, unless the client acknowledges it. So the tapping with set up statements commences. I lead the client through, allow the client to clear the emotional blocks by clearing the presently perceived physiological blocks. Sometimes the client may want to talk about it. I then listen to them while silently tapping and encouraging the client to also do the same. There may periods when the client feels mentally drained and wishes to rest before continuing. Many a time, one may feel that the client is deviating. But by carefully following the client’s sharing one realizes that it is surely related to the root cause. An EFT session is generally a 3-hour slot and in most cases, the client clears the trauma and also learns healthier coping strategies. The added advantage here is that the client, by the end of the session has learnt the tapping technique sufficient enough to use them for various other simple blocks. This is a big advantage of this intervention. The client also becomes self-empowered with regard to the technique. AZ was a young professional who had just completed college and started looking for jobs. Over the last one year, her parents had noticed a gradual decline in her emotional control and slowly other areas of concern, including increased sensitivity towards lights, sounds, voices, a gradual reduction in eye contact, turning verbally abusive and many such traits. The parents reached my center with all of this and their own bag of concerns and worry. In this case, she was aware of some relationship between her symptoms and her traumatic experience of abuse a few years back. The abuser here was her grandfather and added to the trauma of the act, she was also traumatized by the fact of having to respect him by touching his feet and meeting him regularly. While the counseling sessions were also part of the interventions, she overcame all her symptoms of post-traumatic stress disorder through EFT. I helped her go through many EFT sessions, to overcome her shame, her anger, disgust, her low self-worth. The shame and anger were so strong that she had to go through a couple of sessions. Every EFT session brought out a new person in her. She discovered other abuse experiences prior to her grandfather abusing her, which had been pushed to the subconscious. They surfaced in one of the EFT sessions. It seemed highly probable that soon after the initial incidents, she lost her self-worth and hence just gave in to her grandfather. All these were tackled during her EFT for child sexual abuse sessions. Within a few weeks, she was a healthy, happy individual, actively seeking job opportunities. The beauty of EFT is that it is simple, easy to practice and very easily applicable. At the same time, it is very rich in its results. I strongly recommend at least one EFT session for anyone interested in self-enhancement.